With the Australian Grand Prix successfully completed, players are now invited to join in the second edition of the Sydney Cup. 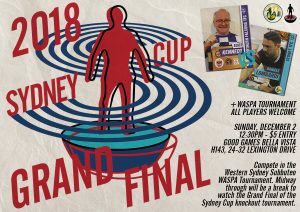 This is a Sydney wide knockout tournament which was first held in 2018. It will span the entire year with the grand final to be scheduled for late Nov/early Dec. The tournament uses a double-elimination system, meaning that players are not knocked out until they lose for a second time. Players will be drawn randomly (there are no seedings at any stage of the tournament, meaning the big guns can sometimes knock each other out early, while some dark horses can make their way deep into the tournament) and given a month to play their game. Games are organised by each pairing, scheduled to suit their own availability. Games can be played at any of the club nights run by the various clubs in Sydney, or at any other time and venue that suits each pairing. All players are invited to join, regardless of age, gender, ability or experience. The commitment required will be to play one game per month until you are knocked out. Players must be available to play their fixtures in Sydney throughout the tournament. Entry is free. Please fill out the form below to register for the tournament. Entries close at midnight on Sunday, Feb 10, 2019. Full tournament details can be found by reading 2019 Sydney Cup tournament guidelines pdf file. This entry was posted in News and tagged sydney cup, sydney cup 2019 on 21/01/2019 by ajebec. With bellies full from Christmas and Boxing Day feasts, and with players needing to begin their preparations for the upcoming Australian Grand Prix, it was a sizeable crowd that rolled up to Bella Vista Good Games on a warm Thursday evening, with representatives from all four Sydney clubs. A last minute realisation that there was a lack of goal posts meant that only 3 of the 6 available pitches could be utilised (we live and learn!) so the 10 players were split into 3 groups, rather than the preferred Swiss System which had been planned. An unseeded draw threw up a number of interesting match ups. In the group stage, both Hermann Kruse and Fabrizio Coco made light work of Adrian Elmer. They finished equal on points after drawing their opening game against each other, but Fabrizio finished in top spot as he hammered Adrian while Hermann could only beat Adrian comfortably. Group Two saw Oliver Ollnow continue his recent run of great results, easily topping his group which featured Dave Sultana and new Sydney TFC recruit, Leonardo Nizzoli. Meanwhile, the 4 player Group Three saw the incredibly unlucky Geoff Sirmai finish in 3rd spot, in spite of amassing 5 points in going undefeated – Both Eliot Kennedy and Steve Dettre also finished on 5 points but had better goal differences than Geoff. Daniel Sirmai was the unfortunate victim of the top 3 players’ quest for better goal differences. In the Repechage section, Adrian saw off Daniel 2-0 while Geoff had the same result against Leonardo. In the Repechage final, Adrian attacked for much of the opening phase, before Geoff came into his own in the latter stages. Neither player could, however, break the other’s defense and so a 0-0 result saw the two share the consolation category. The Barrage saw Hermann score an unexpected 2-1 victory over Eliot, though Hermann’s recent form means that this probably shouldn’t have been a huge surprise. meanwhile, Steve and David fought out a dogged 0-0, Steve eventually coming up trumps, 2-1, in the shootout. 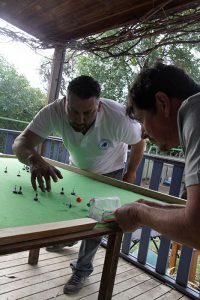 The Semi-final between Fabrizio and Steve was tense for the opening 5 minutes, with neither player taking the upper hand. In a flurry over the next five minutes, however, Fabrizio gained a 2-1 advantage as both goals saw excellent opportunities converted. A late 3rd goal confirmed Fabrizio’s passage to the final. The father and son match-up (Hermann v Oliver) in the other semi, saw Oliver revert to the 9-1 structure which had served him well in his recent Falcons’ WASPA tournament win. Hermann huffed and puffed but struggled to break down Oliver’s dogged defence until later in the game. Hermann then rode out a scary stranded traveling ‘keeper moment to hold on for a 1-0 victory. The final, therefore, saw the two opening game, Group One combatants, meet up again. While they couldn’t be split in their first encounter, Fabrizio had obviously warmed up by now. His two unanswered goals gave him his second tournament win for the month. Thanks to all who turned up and enjoyed yet another hard fought, friendly bunch of games. Thanks, as ever, to our great hosts, Bella Vista Good Games. A happy new year to all with lots more table football action in store. 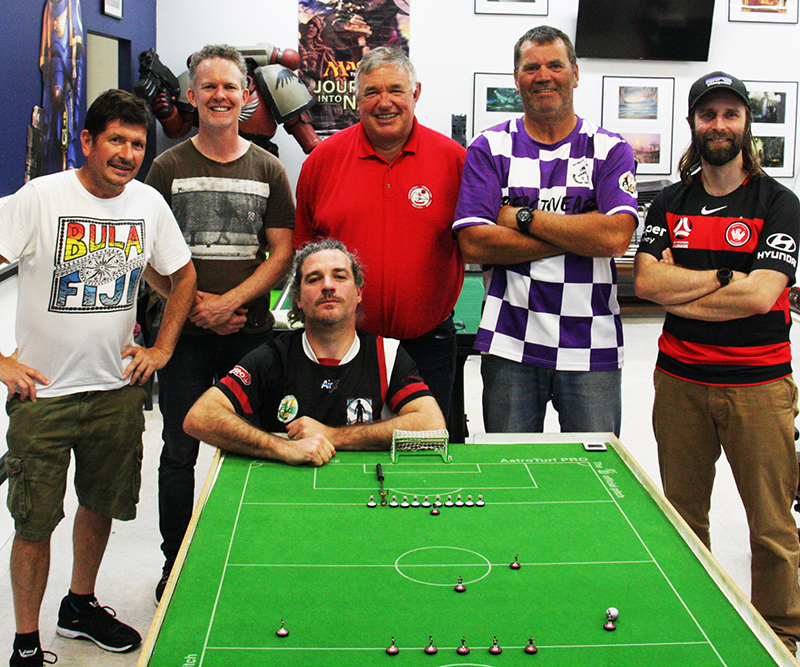 This entry was posted in News and tagged good games bella vista, waspa, waspa tournament, western sydney subbuteo on 01/01/2019 by ajebec. In February, 22 players began the long journey that was the inaugural Sydney Cup. The Sydney Cup was set up as a knockout tournament for all Sydney based players. Players were drawn randomly each round, no seeds, which meant that every round had some very juicy match ups, and the very real possibility of favourites making early exits and underdogs riding the luck of the draw to later rounds. Players were left to organise their own assigned matches, with games being played in games shops, community halls, school rooms, back sheds and lounge rooms across the year. 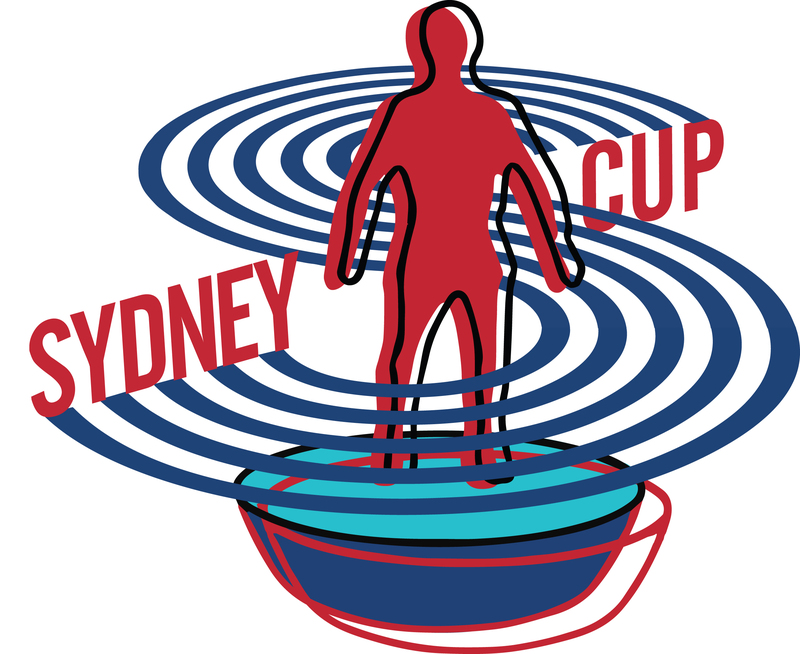 The other feature of the Sydney Cup was the ‘double elimination’ system, meaning that when a player lost for the first time, instead of being eliminated, they dropped from the ‘red’ pool into the ‘blue’ pool. A second loss in the blue pool would see them eliminated, until we were left with just two players – Daniele Lombardi and Eliot Kennedy. And so we came to the 42nd and final game of the competition. The Grand Final was scheduled for Sunday, December 2 and was hosted by Good Games Bella Vista. The two had played a warm up match each before facing off in the final. Eliot won the toss and elected to flick off first. A tense opening saw both players with equal possession. Then, midway through the half, Eliot made a calamitous defensive flick, knocking his own defenders out of the way and gifting Daniele an open shot at goal. However, as Daniele placed his hand to take his shot, his forearm landed on one of Eliot’s figures. The nerves from both players were clearly showing. Eliot’s let-off spurred him into action, though, and, a few minutes later, he opened the scoring with shot on the run that was deftly tucked into the top corner as Daniele could only look on. Eliot relaxed with this and dominated possession for the rest of the half. His shooting proved to be a bit wayward, however and, without making too many clear cut chances, conspired to hit the woodwork and Daniele’s ‘keeper a number of times. The players regathered their thoughts over the half time break and it was Daniele who came out the stronger. An early equaliser meant it was well and truly game on. Eliot responded with renewed pressure and, again, cursed the framework of the goals and Daniele’s ‘keeper as numerous shots failed to bother the scorer. Then, in a classic sucker punch, Daniele counter attacked and took the lead with 6 minutes left on the clock. In spite of his dominance, Eliot found himself behind where it mattered. Still he pressed, and most of the rest of the game found him in or near the shooting zone with Daniele defending stoutly. After a few more shots, even Daniele had to make the comment – “Every time you shoot you shoot straight at my goalkeeper”! With a little under two minutes on the clock, however, Eliot finally had his goal, tying the scores at 2-2, with a huge sigh of relief. And so the scores remained as the 30 minutes came to its conclusion. The players repolished ready for the 10 minutes of golden goal extra time. Eliot lost the toss and so Daniele took the opening flick-off, in spite of a light hearted suggestion to give it to Eliot and so have the opening possession for the (non-existent) second half! Daniele wisely turned the offer down and elected to take the flick-off. It turned out to be his best decision of the afternoon. After the flick-off, Eliot didn’t even get to touch the ball. Daniele manoeuvred his way forward and a slightly overhit defensive flick from Eliot gave Daniele the chance he needed, burying his shot emphatically into the top corner to finish what turned out to be a rather anti-climactic extra time period after the tense to and fro of regular time. Eliot was left to rue the countless shots he had which were saved or hit the woodwork, while Daniele’s accurate finishing from the handful of shots he created during the game proved to be the decisive factor. It was a great grand final played in excellent spirits, with both players honouring some very tight referee calls without comment, and focusing on playing high quality table football. Many congratulations to both players. It was a fitting finale to a year long saga which, we hope, will be the first of many to come for the Sydney Cup. For the full results of all the 2018 Sydney Cup matches, click here. To register for the 2019 Sydney Cup, click here. This entry was posted in News and tagged daniele lombardi, eliot kennedy, sydney cup, sydney cup 2018 on 02/12/2018 by ajebec. It was an evening of schmoozing with the presidents at the HQ of Western Sydney Subbuteo, with Australian Table Football Association president, Adrian Connolly, visiting from Melbourne and the Federation of International Sports Table Football Association president, Steve Dettre, making the trek across from Chatswood. No doubt the other players put in a quiet word with their suggestions for running the game as they took on their illustrious opponents. A small swiss system was battled out. 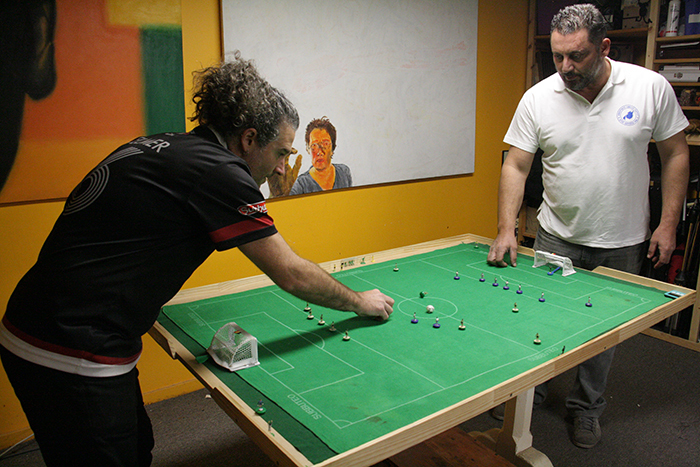 Western Sydney Subbuteo’s Paul Magee and Paul Stockbridge faced each other in the first round, a game which doubled as their WSS Spring League fixture. Paul M slotted a goal in each half to take the game against a quickly improving Paul S. Meanwhile, Steve went down 1-0 to his Northern Falcons club mate, Hermann Kruse. 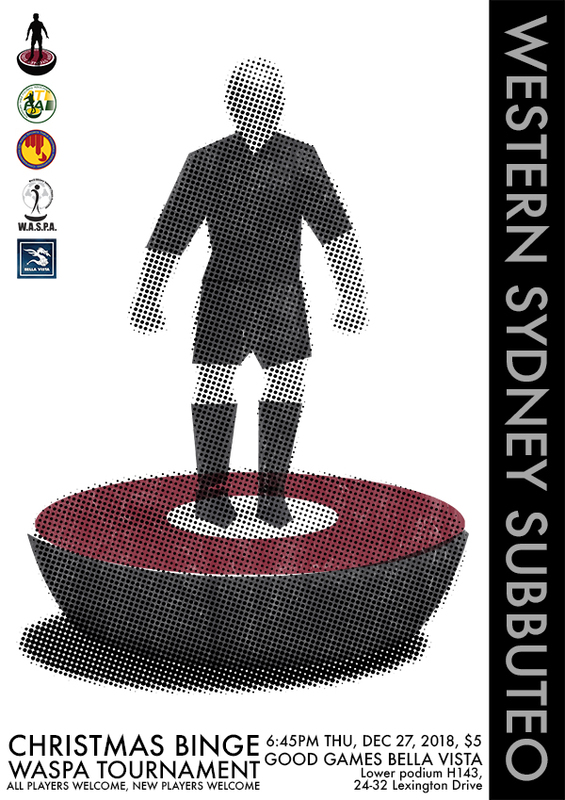 Western Sydney Subbuteo’s Adrian Elmer opened the scoring in his fixture against Adrian C inside the first minute of their clash which proved to be the only goal action of the entire game. Round two pitted Paul M against Hermann. A fixture which is always a tight one proved so again, with Hermann coming out on top via a solitary goal. Adrian E came from behind to pip Steve 2-1. On the third pitch, the ATFA president found that every touch turned to gold as he slammed six goals past a shell-shocked Paul S.
The final round saw Paul S recover to go down valiantly 2-1 to the other president, Steve, while Paul and Adrian C battled out a hard fought, goalless match in their first ever meeting. In the tussle for the title, Hermann and Adrian E picked up their ongoing rivalry with another evenly pitted battle. Adrian took the lead midway through the game and tried valiantly to hold on, but the extra pressure Hermann put on chasing the equaliser paid dividends with an equaliser with a few minutes to go, meaning the title would be shared between the two. An excellent evening of friendly competition, with many thanks, as usual, to our hosts at Bella Vista Good Games. This entry was posted in News, Tournament reports and tagged adrian connolly, adrian elmer, good games bella vista, hermann kruse, paul magee, paul stocbridge, steve dettre, tournament report, waspa, waspa tournament, western sydney subbuteo, western sydney subbuteo spring league 2018 on 20/10/2018 by ajebec. 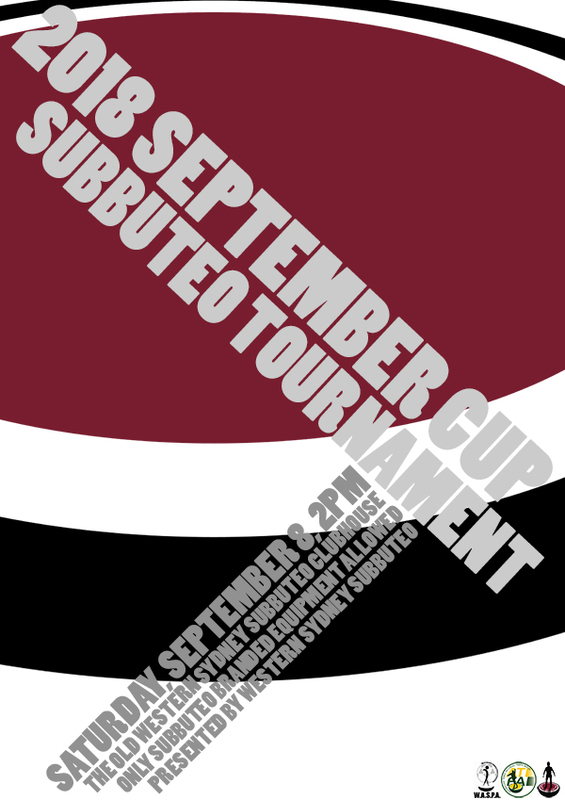 September means a couple of important things for Western Sydney Subbuteo, the beginning of the annual Spring League and the staging of Australia’s longest continually running tournament – The September Cup. 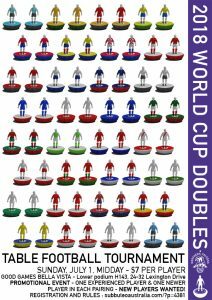 The September Cup also contains an element of particular fondness for competitors as, in keeping with the tournaments history, only Subbuteo branded figures and pitches are used. So, for one tournament every year, 90s Hasbro bases rub up against 80s lightweights, 60s heavyweights and even the occasional team of cardboard or celluloid flats. This year, 8 competitors turned up to The Old Clubhouse in Toongabbie. Split into two unseeded groups, play soon got underway on one of the coldest September days in living memory. This fact made things interesting for one pitch in particular, the outdoor verandah pitch, where players complained of cold fingers. Adrian and Kostas in their opening round battle. Early games saw Kostas Barbaris come from behind to take a 2-1 victory over Adrian Elmer, Paul Magee and Hermann Kruse batle out a frustrating 0-0 draw, Eliot Kennedy edging Costa Kamarados 1-0 and Antonio Credentino putting 2 unanswered past Oli Ollnow who was playing with old bases for the first time in his life. By the second round of games, Oli had got much more used to the bases and ran out 2-0 over Costa. Eliot got on a goalscoring roll, beating Antonio 3-1, though the general play was closer than this. Paul and Kostas scored a goal each in their match while Adrian broke Hermann’s heart with a solitary winner scored with just 4 seconds left on the clock. Eliot shows poise against Oli. In the final group games, Group B was reasonably straight forward. Eliot continued his good goalscoring form, in spite of his jetlag (he had made an overnight flight from Korea just to be at the tournament) and was particularly pleased that some of his 1970s curling skills were able to be used for one goal in particular as he beat Oli 3-0. Antonio put 2 past Costa, meaning Eliot and he wrapped up the two top positions in the group. Group B was much more open, with all four players still able to progress and all four players still in danger of missing out. And this was reflected in the tightness of the games. Kostas kept up his unbeaten run with a 1-0 victory over Hermann which gave him top spot in the group and vanquished Hermann to the foot of the table. Meanwhile, Paul used the ‘Magee Swarm’ for large swathes of his match against Adrian, a factor which contributed to him scoring the game’s solitary goal when Adrian fell victim to the dreaded stranded travelling ‘keeper. The Consolation Semi-Finals saw Adrian victorious 2-0 over Costa while the father-son showdown between Hermann and Oli provided some of the afternoon’s more boisterous moments. Players inside the clubhouse noted that things must be going bad for Hermann to celebrate a goal so loudly while playing against his son as one of his reactions to scoring on the outdoor pitch could be heard from right around the entire property! In the end, however, this was not enough, Oli running out a 3-2 victor. In the 7th/8th play-off, Hermann took out his frustrations 2-0 over Costa, who finished the tournament with the honour of not managing to get his early 80s lightweights to trouble the scorer across the day. in the 5th/6th playoff, Adrian repeated his earlier feat against Hermann, this time against the son, Oli, as he scored a winner with 13 seconds to go after a very even match. Kostas come close against Paul in the cold in the 3rd/4th playoff. The main Semi-Finals saw Antonio finally put Kostas’ unbeaten run to an end with a convincing 3-0 victory. The other match saw the day’s two past masters, legends of the round based figures game from the 1970s and 80s – Paul and Eliot – face each other in the showdown. And the game proved to be as exciting as it had promised. Eliot came out on top in the end (no doubt, the cider he had begun consuming was helping him overcome his jetlag) but it took all 3 of his goals to beat Paul who scored 2 of his own. The 3rd/4th play-off between Paul and Kostas found the pair unable to break each other’s defenses and so the day’s first shootout ensued. After the tightness of the game, the shootout was a one sided affair, with Paul running out a 3-0 winner after only 3 shots each, to snag 3rd place. Which left just the Grand Final to be played between Antonio and Eliot. As with the 3rd/4th playoff (and, to show just how even things actually were between all the players across the afternoon), the 20 minutes of regular play failed to split the pair. In truth, it was a reasonably dour affair with lots of midfield tussling but not much goalmouth action. And so the players went to shots. Eliot opened his account with a goal from his first shot, then saved Antonio’s effort. From here, things went a little pear shaped for Eliot, however, as is often the case for him in shootout situations. However, he did cling on for a 2-2 scoreline at the completion of the five shots apiece. And so, to sudden death they went. Eliot’s first shot was fired straight at Antonio’s ‘keeper, knocking it away from the goal. Antonio then replied with a deft chip that beat Eliot’s ‘keeper at the near post to take the title. Thanks again to all the players who got right into the spirit of retro fun and fair play that the tournament has come to be known for. A new name on the old trophy is always a great thing as well, so well done to Antonio for joining the elite club. And, to the eternal bridesmaid, Eliot, there’s always next year. 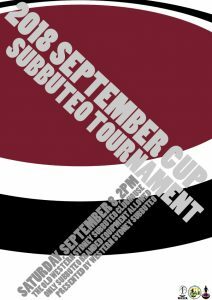 This entry was posted in News, Tournament reports and tagged adrian elmer, antonio credentino, costa kamarados, eliot kennedy, hermann kruse, kostas barbaris, oli ollnow, paul magee, september cup, september cup 2018, western sydney subbuteo on 11/09/2018 by ajebec. This entry was posted in News and tagged 2019 australian grand prix, australian grand prix, fistf, northern falcons, poster, Sydney, sydney tfc, waspa tournament, western sydney subbuteo on 31/08/2018 by ajebec. It’s that time of year again. The days are starting to get longer and the chill in the air isn’t so biting. The semis are rolling around in your football season and so you’re looking for something to fill the void once it’s all over. The Western Sydney Subbuteo Spring League is about to swing into action to fill all your footballing needs. 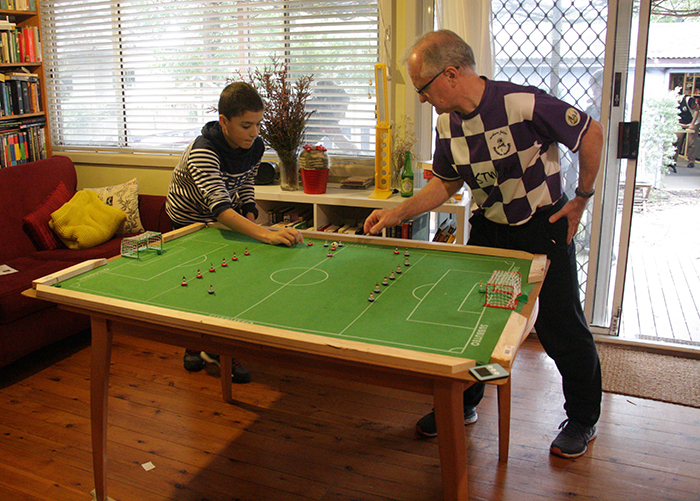 Now in its 5th year, the Western Sydney Subbuteo Spring League is open to all players, regardless of age, experience or ability. Registration in the League is free and will automatically earn players membership into Western Sydney Subbuteo for the upcoming table football season (Sep 2018 – Aug 2019). Games are played weekly during the Spring months, but players will, on average, only need to be available for about 2 of every 3 weeks. The first and third weeks of each month will see us gather at Good Games Bella Vista for matches, while alternate weeks will see us play at a variety of venues around the area. Players can nominate which days of the week work best for them and the draw will be worked out around whatever suits the majority of players, with different days used in different weeks to allow players with other commitments to still compete. A copy of the League rules can be downloaded by clicking here. Please fill out the registration form below to secure your spot in this season’s Spring League. This entry was posted in News and tagged spring league, spring league 2018, western sydney subbuteo, western sydney subbuteo spring league, western sydney subbuteo spring league 2018 on 01/08/2018 by ajebec. WASPA World Rankings for both the Opens and Junior categories are in for July. In the Opens, Western Flickers’ Benny Ng maintains daylight between himself and second placed Fabrizio Coco of Sydney TFC, while Oliver Ollnow of Northern Falcons TFC holds the lead in the Juniors, ahead of Benjamin Ng of Western Flickers. There are currently 126 Australian players in the Open rankings and, in the Juniors (a new system only set up a few months ago), 24 players. To see the full rankings, click here. This entry was posted in News on 19/07/2018 by ajebec. On Sunday, August 5, ATFA will be holding its annual general meeting, at Good Games Bella Vista in Sydney, from 3PM. As with last year’s meeting, all ATFA members are invited to participate – a Facebook video conference will be set up for those around the country (and, indeed, the world!) to be able to tune in. The main item on the agenda for the meeting will be the election of the ATFA Committee for the 2018/19 season. To that end, nominations are now open for the Committee. As per our constitution, ATFA Members are able to nominate any other ATFA Member (i.e. you can’t nominate yourself) for a position on the Committee, as long as it is SECONDED by another member AND agreed to by the nominee. 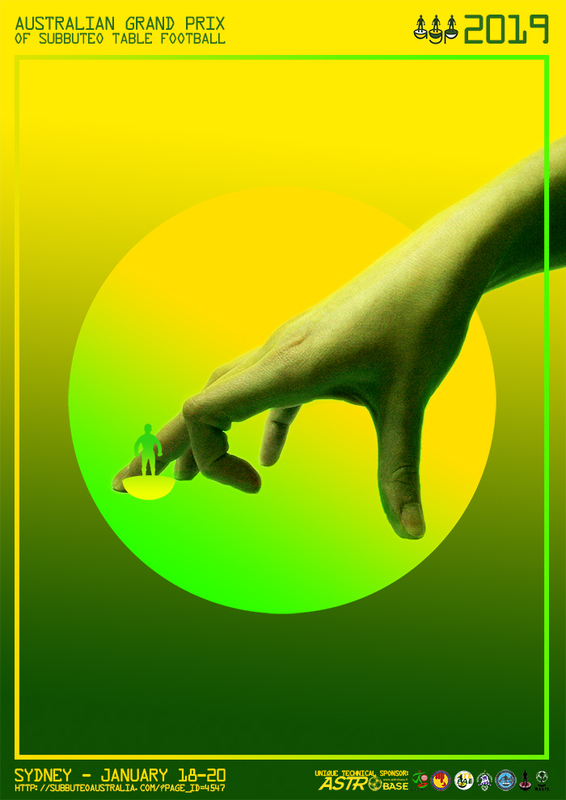 Members are free to make as many nominations as they like. The committee consists of 7 people. 4 of those are Office Bearers and the other 3 are Committee Advisors. The roles for each are outlined below. If you are a member and would like to nominate someone, fill in the details below. Please note, ALL info requested must be supplied in order for the nomination to be valid. President : oversees the Committee. In conjunction with the Committee, the President sets dates for, and convenes Committee meetings as required, including the compulsory Annual General Meeting following the close of each financial year; presides as chairperson over all Committee meetings. Vice President : assists the Committee President in all the President’s duties. Treasurer : oversees ATFA’s monetary concerns: the running of ATFA’s bank account; supplying annual profit/loss overviews to the Committee and ATFA Membership; keeping records of all expenses and income. Secretary General : is responsible for: supplying all documentation required by FISTF in regards to ATFA club and player memberships; FISTF tournament registrations and results or any other necessary documents; keep minutes of all committee or general meetings. 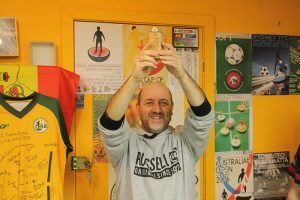 Committee Advisor (Communications Officer) : is responsible for communications to the Australian Subbuteo community, including: the upkeep and co-ordination of the ATFA website; the ATFA calendar; the ATFA mailing list. Committee Advisor (General) (x2) : offers advice and assistance to the rest of the Committee in relation to all decisions made at the Committee level. All Committee Members will be equally responsible for the discussion and decision making processes for any issue required of the Committee. It is expected that all Committee Members will be proactive in promoting Subbuteo Table Football in their local context and will undertake all their table footballing duties, including Committee membership, with the best interests of the game in Australia at heart. This entry was posted in News and tagged atfa committee, atfa committee election, committee election, election on 04/07/2018 by ajebec. 41 years ago, 50 members of Sydney’s Subbuteo crowd staged their own ‘World Cup’. This was the famous ‘Doubles’ format, with players adopting a national team: Geoff Sirmai and Johnny Rado as Hungary; Don and Gary Hosie as England; Martin and Eliot Kennedy as Australia, and so on! Matches produced plenty of drama, fun and spectacular goals. 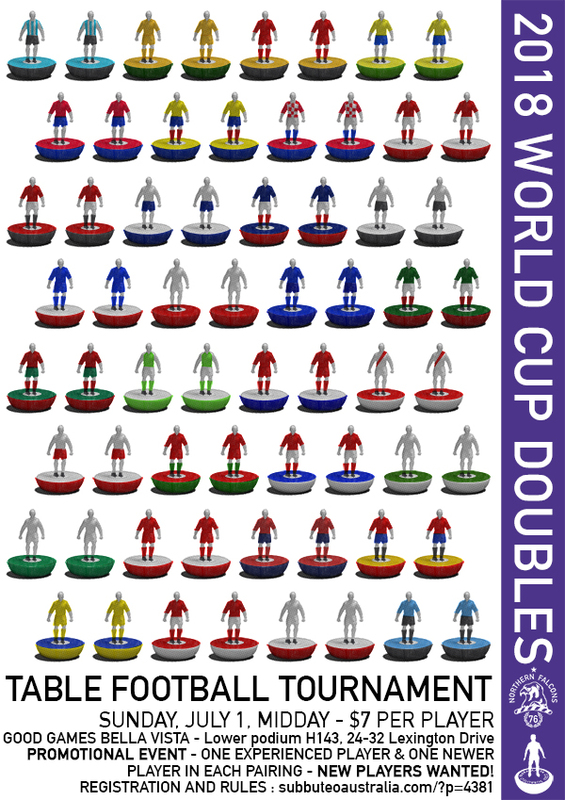 In conjunction with the forthcoming FIFA World Cup, Northern Falcons TFC and Subbuteo Parramatta are combining to host another ‘World Cup’ (Doubles) on Sunday, July 1, 2018, with some additional rules about pairings. Entry will be $7 per player. Pairs will be drawn before the event, with a more experienced player being drawn with a newbie or beginner. Any team comprising a beginner will get THREE free-shots before the match, and will start with however many goals they score!! If two players want to pre-nominate as a pair, they can, but then the entry fee is $14 each. Pairings who wear the national strip of their nominated country will get a bonus point in their group table. Any national team is valid. If you want to select your team, that’s another $10 fee! Otherwise all teams will be assigned with a random draw, comprised of the teams playing at the World Cup in Russia. All money will go towards the organisation of the AGP19!! This is a great chance to bring along a friend, as Doubles is a good introduction to the game. Advice on the run from their team mate will help less experienced players. The tournament will be held at Good Games Bella Vista – Lower Podium H143, 24-32 Lexington Drive, Bella Vista, Sydney. Players should arrive at midday and the first round of games will begin at 12:30PM. Register below by midnight, Thursday, June 28. Pairings will be drawn on Friday, June 29. Special rules for the doubles format can be found by clicking here. This entry was posted in News, Upcoming tournaments on 09/06/2018 by ajebec.